This week for Microbial Monday I’m bringing you something a little bit different. 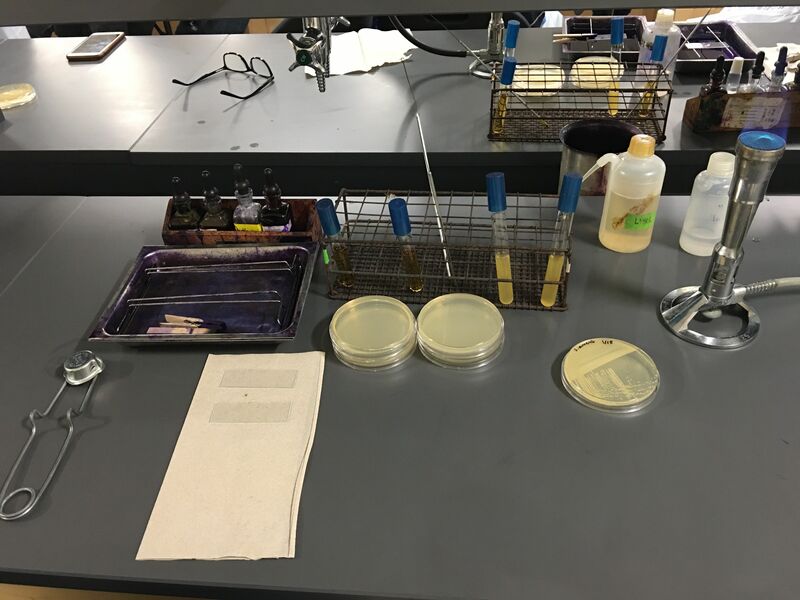 I recently began my PhD at the University of Texas at Arlington and along with my schooling I was provided the opportunity to teach Microbiology labs! For our first week, I gave the students a little take home experiment that I’d like to report back on. I handed out two sample plates to each student (48 plates in total) and told them to use one plate as a “touch” plate and one as an “environmental” plate. Basically they were told to swab a surface of their choosing and culture whatever organisms are there, as well as opening the lid to the petri dish in whatever environment they choose in order to sample air quality in that area. Actual Indoor Air Quality testing protocols are very tedious, repetitive, and can become very expensive. This is because of the range of contaminants that are potentially in your home. The most important, as categorized by the EPA are: radon, biological contaminants, and VOC’s (volatile organic carbons). Radon and VOC’s can typically be measured by devices such as a Summa canister, which takes in a set amount of air over a set period of time to be sampled. Biological contaminants are a bit trickier due to the sampling methods. There’s impingement traps which intake a variable flow rate and run the air intake through a liquid media of some sort, and there’s also impaction traps which use solid agar media (typically Tryptic Soy Agar, as we used in class) as the medium for particle impaction. Since Impaction traps function by means of velocity, the size of the particle determines where it will lie on the tower of Agar plates. Also commonly used are Centrifugation and Filtration devices. Sampling can be done in three broad categories: Continuous, Integrated, and Spot sampling. Continuous is obviously the most sure-fire way to get the results you’re looking for, but the others work as well and are a lot more financially agreeable. With Spot sampling, the EPA suggests a minimum of 5 samples at each location as well as a sample taken outside the environment being tested to achieve background levels of each reading. The samples must also be taken at 1.5 meters high, the height of the average person. This makes sense as we are verifying the effects of the indoor air quality on human health. While none of these nuances were observed for my students environmental plates, we aren’t trying to publish this information so I’d reckon it’s okay. A generalized approach to classifying the environment around us is all I was shooting for, well that and to perpetuate the awesomeness that is Microbiology! I will be posting this blog then follow it up later tonight on our Instagram with many pictures of my students plates, come check them out!